It appears that SAT does not have any other projects other than the SR-10 family. Most likely, it is an offshoot of the Sukhoi design house, which used to have a PTS branch, an acronym for “Advanced Technologies of Sukhoi,” that specialized in lightweight sport airplanes made of composite materials. Before PTS ceased activities, its leaders spoke of a lightweight all-composite jet that would supplement the Yakovlev Yak-130 twinjet as a compact, easy-to-fly and affordable airplane. The SR-10 has a gross weight of three metric tons. It is capable of 9g maneuvering thanks to a high thrust-to-weight ratio using the old, yet simple and reliable Ivchenko/Motor-Sich AI-25TL engine producing 3,860 pounds of thrust. The high thrust-to-weight ratio is seen as a necessity so that the airplane can not only temporarily enter, but maintain, high angles of attack for a sufficient duration to train novice fighter pilots how to manage such regimes. In addition, the SR-10 has a forward-swept wing coupled with extensive fuselage-to-wing extensions. This configuration gives the jet very good performance at high angles of attack, while making it easy to handle at all flight regimes. This concept came into consideration in the late 1990s, but proved difficult to materialize. To produce a forward-swept wing for high-alpha flying is a serious scientific and technological challenge. The specifics of air flow over the forward-swept wing ruled out using metals in its structure, demanding composite materials with smart internal structure to specifically address the issue. At the turn of the century, Sukhoi flight-tested the S-37/Su-47 Berkut experimental aircraft, but the Russian air force refused to accept it as a base for development of a fifth generation fighter. The program was discontinued, but gave the Russian scientists and designers some vital experience on forward-swept wings made of composite materials. At MAKS 2009, SAT demonstrated an airframe made of composites, but few believed the program could develop further. Despite doubts, the program proceeded well and passed a preliminary MoD evaluation in 2014. The first prototype rolled out in August 2015 and took to the air for the first time in December. Test flights proceeded well, and in summer 2016 the Russian Air and Space Force (VKS) made the decision to financially support the SR-10 project and subject the prototypes to state evaluation trials at the Kubinka AFB. The Tactical Missile Corporation’s plant at Smolensk—which had sufficient experience of making composite structures—was ordered to commence preparations for series production of the SR-10. Specialized avionics companies were tasked to develop a glass cockpit for the plane. The Russian air force intends to use the SR-10 as a direct replacement for the Aero L-39 Albatros for both initial and main pilot training courses. 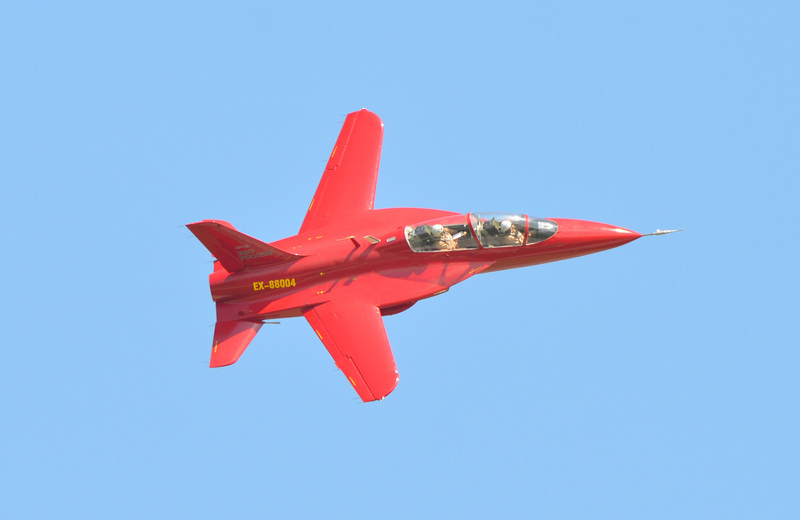 The larger Yak-130 will be confined to weapons training, and the smaller Yak-152 to a pilot-screening role. Following the annexation of Crimea, relations between Ukraine and Russia deteriorated. This prompted a decision by SAT to re-engine the SR-10 with Russia’s NPO Saturn AL-55 engine developed for the Indian Advanced Jet Trainer also known as the HAL HJT-36. The aircraft that flew daily at MAKS 2017 will continue to rely on the Ukrainian powerplant, but all newly built airplanes will be powered by the Russian alternative. The AL-55 is far more advanced, yet costly, but promises a considerable improvement in SR-10 flight performance. At MAKS 2017, SAT announced plans to use SR-10 airframe to produce the AR-10 Argument UCAV that would specialize in low-level strikes on high-value targets and be also capable of shooting down enemy’s flying vehicles.